This entry was posted in Book reviews, Oral history. Bookmark the permalink. Heard about one tenement, heard them all. Probably not so different to No Mean Way was it called? The one set in Glasgow’s Gorbals. Interesting about the Anglo Irish departure though. I wasn’t aware of the details. Andrew, agreed. I would have assumed that one diabolical slum was very much like any other diabolical slum of the same era. 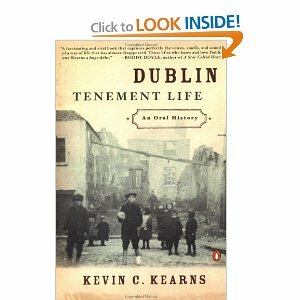 It is, however, noteworthy that the tenement process in Dublin was particularly accelerated after a _specific_ 1801 Act that emptied the city of the Anglo-Irish gentry. These were the very people who had built their lovely Georgian houses terraces and squares close to the centre of town. I couldn’t understand the situation in Spitalfields either. It had been the site of good quality Huguenot weavers’ homes in the early 18th century and later the site for fine quality Georgian homes. But eventually it became squalid, impoverished and overcrowded. When did property values plummet steeply and suddenly?